You are invited to attend a dinner and silent auction. Works by Gregory Antollino, Georgina Bedrosian, Victor Carnuccio, Regina Cherry, Crista Grauer, Jason Huff, John Kelly, Erik Patton, Cari Rosmartin, Sumayyah Samaha, Allon Schemool, Bushra Shamma, Marianne Sheil and David Thomas. Sponsor a friend to attend. 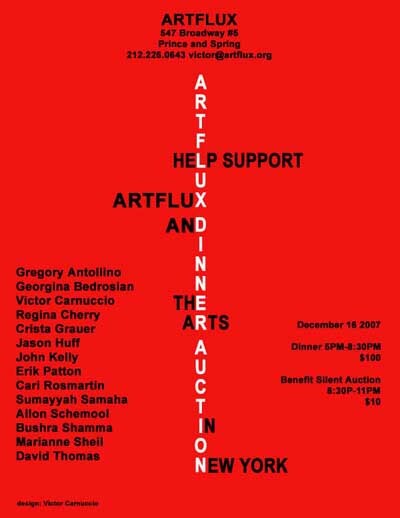 Send a donation directly to Artrflux. Click above to see gallery link.